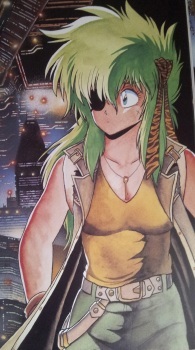 A female mercenary that appears in several of Johji Manabe's works. She gets her own story in Dora and is a supporting character both Capricorn and Caravan Kidd. In Capricorn, Khada has a special eye hidden under her eye patch that causes Mona to transform into her true form.